This is how It came to my mind that a tree would be the perfect analogy to design my diagram since each client definitely has roots, branches and of course a tree trunk. Starting from the ground, normally when clients partner with Winclap, they do it since they trust and believe in our roots. That would be our Strong Tech, Transparency, Excellence and Knowledge. Then, the tree trunk would be the Business Development Teamwork: Lead, Discovery, Follow Up, Framework. Without it, the tree wouldn't exist. If you have a strong trunk you will be able to send nutrients to every branch. As a Growth Manager, I am in charge of watering the tree and creating the perfect environment, so our client’s branches can grow healthy and strong. That would be: Performance, Creatives and of course fight against fraud. By Performance, I am speaking about the client's KPIs, the UX/UI of the App, are they in a UA stage or re-engagmente stage. Also it will include building a strong media buying mix and understand each media source correctly by analysing data, developing lift-test and predict LTV correctly. By Creatives, I mean understanding which formats and sizes are performing better, when should I add new ones to avoid fatigue, work on creative calendar, use data to work on new ones and start all over again every time a new campaign arrives. And of course Fraud, it a very sensitive part of our tree. I am on top of every media source to analyze deeply the behaviour of the users, to be aware of all the possible fraud types that can make my tree sick. After analyzing and taking care of all branches of the whole tree, I realized that managing a client doesn't embrace only those parts separately. As a GM, I have to deal with plenty of matters that go beyond our tree: Technical issues, Human Relation, Develop and present captivating storytellings based on data, understand and get aligned with the client's company vision or even recognize the how much they know about the industry. In other words, you need to be deeply dedicated to your clients, to comprehend every detail of the campaigns you are managing and at the same time work on a effective communication to achieve the best results possible. Dealing with a campaign is not an easy thing at all. “The whole is something else than the sum of its parts.” says Kurt Kuffka. There is no diagram or process that will definitely lead you to success, it can really help, though. I believe if you truly put your heart into understanding your client’s needs, build a transparent relationship and perform all the positive initiatives on every single branch, you will provide the water, nutrients and the perfect environment to really make the tree grow. 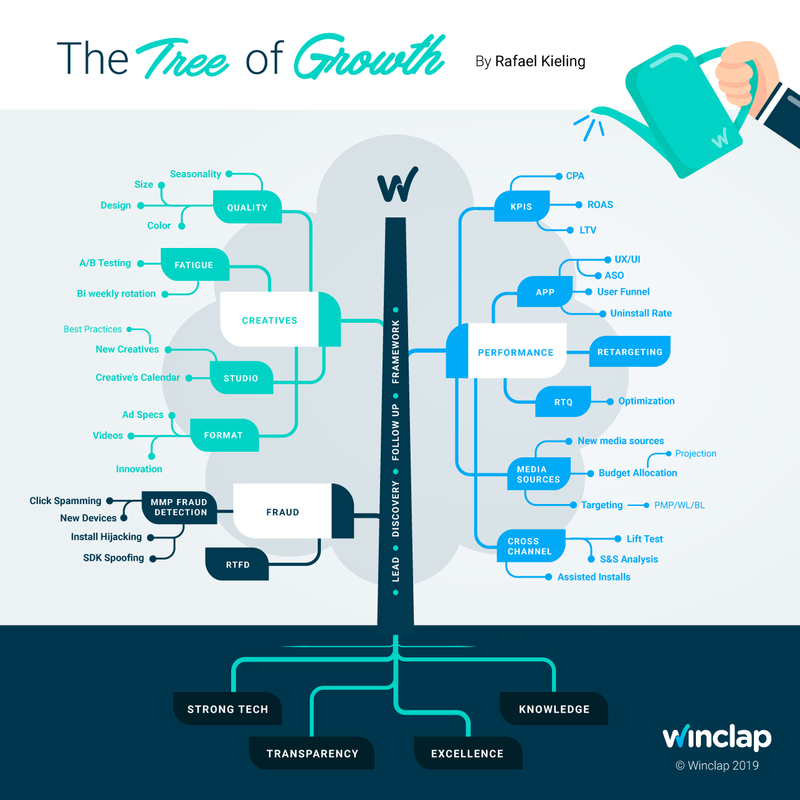 Feel free to contact Rafa to work on your own "Tree of Growth".